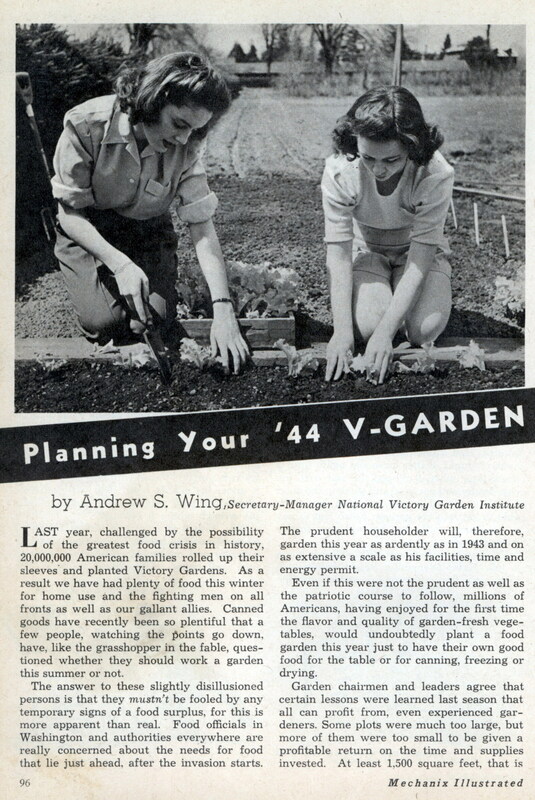 Have you started your victory garden yet? LAST year, challenged by the possibility of the greatest food crisis in history, 20,000,000 American families rolled up their sleeves and planted Victory Gardens. As a result we have had plenty of food this winter for home use and the fighting men on all fronts as well as our gallant allies. Canned goods have recently been so plentiful that a few people, watching the points go down, have, like the grasshopper in the fable, questioned whether they should work a garden this summer or not. The answer to these slightly disillusioned persons is that they mustn’t be fooled by any temporary signs of a food surplus, for this is more apparent than real. Food officials in Washington and authorities everywhere are really concerned about the needs for food that lie just ahead, after the invasion starts. The prudent householder will, therefore, garden this year as ardently as in 1943 and on as extensive a scale as his facilities, time and energy permit. Even if this were not the prudent as well as the patriotic course to follow, millions of Americans, having enjoyed for the first time the flavor and quality of garden-fresh vegetables, would undoubtedly plant a food garden this year just to have their own good food for the table or for canning, freezing or drying. Garden chairmen and leaders agree that certain lessons were learned last season that all can profit from, even experienced gardeners. Some plots were much too large, but more of them were too small to be given a profitable return on the time and supplies invested. At least 1.500 square feet, that is about 30 by 50 feet, is recommended wherever it is possible. Many smaller plots yielded as much food as small families needed, when properly planned and tended. But if your own available plot is too small, too shady, full of tree roots, or if the soil is hopelessly poor, rocky, or wet, better look around for a suitable plot elsewhere. Perhaps there’s a vacant lot nearby, a community garden, or a bit of land which a neighbor or a generous farmer or estate owner will share with you. Many large and small industrial concerns, and even banks and other business firms are planning community gardens this summer for employees who have no land of their own. Plowing will be done free and in some cases lime, fertilizer, seeds and other supplies will be provided at a nominal price or even without cost. Fortunate is the gardener who has an old and fertile piece of ground to workâ€” one that he has worked, for then he will know just how to handle it. Having found a good plot, the next thing to do is to make a plan, if it hasn’t already been done. Lose no time in figuring exactly what you need in the way of seeds, tools and supplies. Then order them at once, for while there will be plenty of some things, shortages of others may develop. Remember that most forehanded gardeners will have already done so long before you read this. Take a piece of paper or cardboardâ€”a shirt filler will doâ€”and mark off your garden boundaries to scale. Five or ten feet to an inch is a handy scale. Then decide which way the rows are to go. North and south is usually best, though if your plot gets mostly early morning or afternoon sun you may want to run the rows east and west. At least six hours of direct sunlight is necessary to mature most vegetable crops. Arrange the crops so that the tall ones won’t shade the low growers, which means that corn and pole must go at the end of the garden away from the sun. an elemental point that many gardeners ignore. 2. Value from a food and vitamin standpoint. 3. Ease or difficulty of growing. (Summer squash is easy, melons are difficult). 4. Amount of space required. (Small plots should not be planted to crops requiring much space, such as corn and potatoes). 5. Both early and late varieties of such things as corn, beets, and different types of lettuce and beans are desirable if you have the space. Take a new seed catalogue from a reliable house and go through it from beginning to end, reading variety descriptions and marking every spot that seems best suited for your purpose and needs. Then eliminate the ones that are doubtful. A packet of seed is enough for several plantings in the average garden. Don’t buy pounds of seed, not even beans and corn, when packets are sufficient. Seed is too precious to buy more than you need. In the case of tomatoes, peppers, cabbage, broccoli and a few other things, it is usually better to buy plants rather than seed unless your garden is large and you have a hotbed or coldframe in which to start your plants indoors. But if you do buy plants make sure that they are good, named varieties from a reliable source. You can get an earlier start by buying sturdy, potgrown plants than by trying to nurse your own along in a skimpy window box. If you want to grow your own plants, get the proper equipment and start them the right way. Here are some points to keep in mind in making up your list: Tomatoes probably pay better than any other crop so have from five to ten plants for each member of the family, depending on how much canning you are planning to do. Quality and disease resistance are more important than super size. Marglobe, Rutgers and Scarlet Topper are better sorts for the home garden than Ponderosa, Beefsteak or Ox-heart, but have a few of those too and some of the small-fruited varieties if you like them. Since tomato plants are not set out until the nights are fairly warm, the rows can be planted with early crops such as radishes and lettuce, which may be thinned out to make room for the tomatoes. Fifty tomato plants require 100 feet of row. Beans probably rank next to tomatoes in value from food standpoint and almost everyone likes them. Pole varieties will give you a larger yield but mature later, also they last longer if you keep the bean beetles away. If you have the poles, I suggest both bush and pole snap beans, of a stringless sort such as Tendergreen (bush) and Kentucky Wonder (pole). Lima beans are delicious but more difficult, therefore optional. Plant several varieties of lettuce: loose leaf, loose head, and Cos or Romaine. Plant short bits of row at intervals of a week or ten days, rather than long rows that will mature all at one time and go to seed wasted. Make at least two or three plantings of carrots but at intervals so that there will be tender ones coming on through the season and some left over for storage. The same principle applies to beets but here use a large late variety for storage such as Winter Keeper. When it comes to the green and leafy vegetables that are rich in vitamins such as spinach, New Zealand spinach, Swiss chard, mustard, turnip greens, collards and kale, be sure your family will eat them before ordering the seed. All are good if you like them but some people don’t. Ordinary spinach runs to seed fast so have some other things to follow. Kale is valuable for fall as it will stand a deal of frost. Remember that even with such root crops as beets and turnips, the tops are richer in vitamins than are the roots of the plant. Peas are difficult in some sections, and one rarely gets more than one good picking. The tall varieties yield better than the dwarf sorts but must have brush or wire to cling to. I seldom plant them for the above reasons, but they are delicious fresh or frozen. Sweet corn belongs in every large garden, but really doesn’t pay in the small plot. However, if you must have your own corn, even at the expense of more productive vegetables, who am I to say you nay? There are some new dwarf varieties recommended for V-gardens that require less space, but their ears are small though sweet. Cabbage is usually cheaper to buy than other crops but in these war years it pays. A greater delicacy, if you like it, is broccoli as it can be cut again and again and it will last until well after frost. However, it does not do as well in the southern states as in the North, it being a cool weather crop. The same thing applies to Brussels sprouts, which don’t start “sprouting” until cool weather arrives. Cauliflower is difficult to grow well in the home garden. Bush squashes such as Zuccini, Cocqzelle and Straightneck yield abundantly throughout the late summer and fall, but don’t keep. The winter squashes take a lot of room and are harder to grow. Acorn and Butternut are fine for quality. Having made your garden plan, order your seeds at once; also any tools, insecticides, and fertilizer that may be needed. Meanwhile you should have found out whether your soil needs lime. A simple test with a bit of litmus paper will tell you whether your soil is acid enough to require liming. Put the lime on after spading rather than before and rake it in. If the ground breaks up nicely and seems dark and mellow you probably can get by with just a complete chemical or Victory Garden fertilizer, but if it seems hard or is sandy, probably humus is lacking. Well-rotted manure should be obtained if available, or peat moss or compost. There are other forms of organic plant food including bone meal, dried cow manure and sewage sludge that are useful. Apply the fertilizer at the time of planting in the row or alongside, rather than by broadcasting it. But if it is a chemical plant food, don’t plant the seed in the drill with it but cover up the fertilizer with a bit of soil first. Time spent preparing the soil for seeding is always well spent. You can’t do a good job of seeding in a row that is full of clods, sticks and stones, or that is not smooth and level. Straight rows will make cultivating easier and look better. Lose no time in thinning out the young plants to the proper spacing. Some plants may be moved to other rows, but even if they are thrown away it is better than to have them grow up weak and spindly from overcrowding. Don’t try to plant all your garden at one time. Start with a few rows of the hardiest things such as radishes, lettuce, beets and carrots, but save the big-seeded crops such as corn and beans until the nights are warm and danger of frost is over. Consult your local garden chairman or state college bulletin for planting dates, or an experienced neighbor. Don’t attempt a garden in unsuitable soil. Test it before putting in time and expense. Don’t grow big-area crops, such as corn or potatoes, in a small plot. Don’t fail to have adequate spraying or dusting equipment on hand. Don’t ignore early evidences of insect attack. 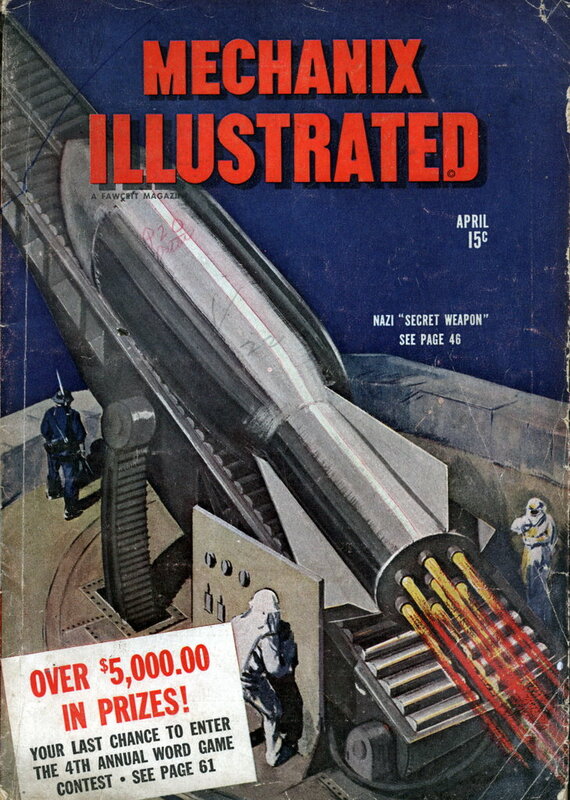 Blttz ’em before they get a real “beachhead” established. Don’t (on the other hand) over-apply insecticides or the plants may suffer too. Don’t accept advice from everybody. There are as many “tinkering” gardeners as mechanics Follow orthodox methods. WOW!!! I am doing a project on victory gardens and this rocks!!! Also very interesting and educational. I think we should plant victory gardens today! I think it is time once again for “victory gardens” with all the reports of recalls for salmonella and e.coli, and who knows what else in our food supply, along with the rising cost. Square foot gardening and container gardening can be done where space is at a premium too!